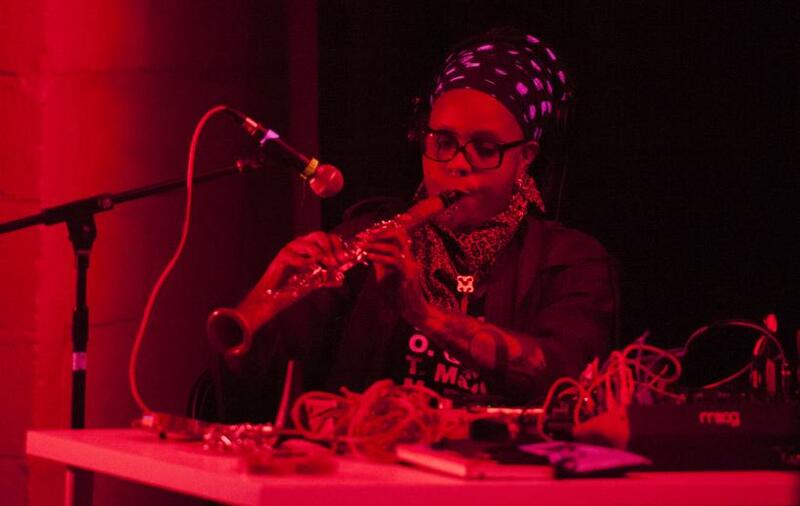 In the intimate setting of Centrala, Birmingham, US mixed media artist, Matana Roberts and British sound artist/improviser, Kelly Jayne Jones were sat on either side of the stage. 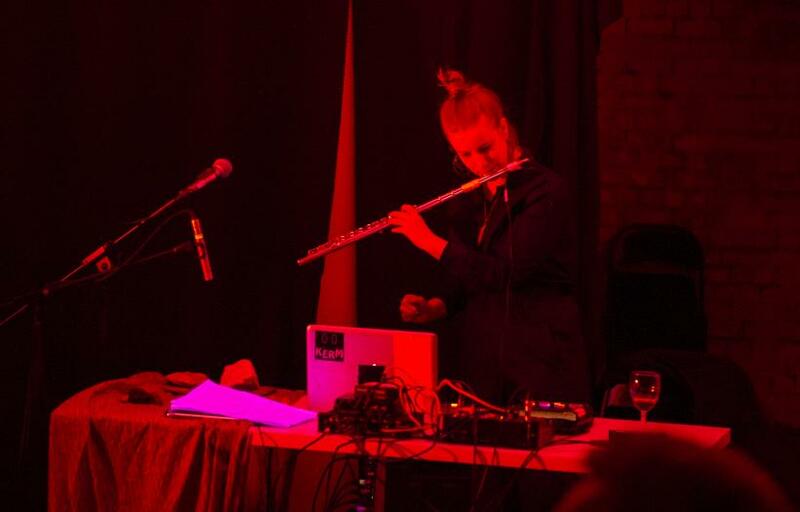 In front of the artists were two tables adorned with a variety of musical instruments, which included a clarinet, saxophone, and electro-acoustic equipment, as well as other sound producing items such as a rock, fan, and two laptops. The room was low lit, casting a dim light on the artists. They began by reading aloud, “Let me begin this infinite rehearsal”, which was repeated back and forth between the two artists and followed by a reading of text in disarray. 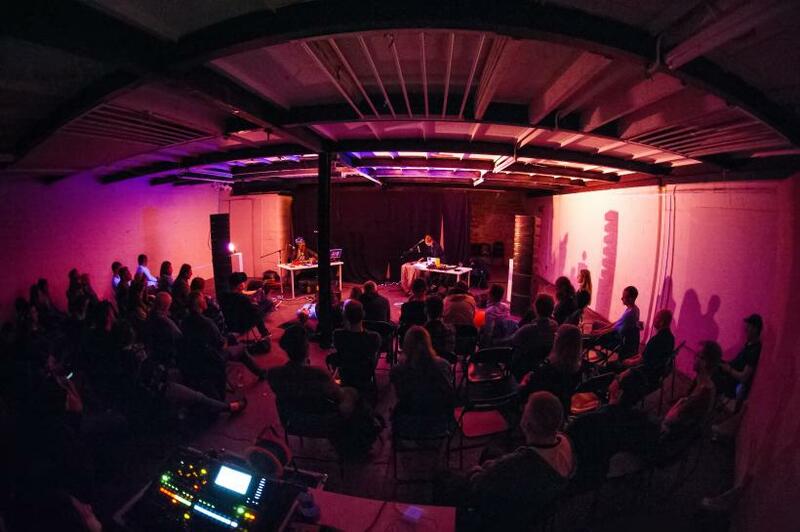 The event was presented by Supersonic Festival as part of Outlands, the UK’s new national experimental touring network, ahead of the host’s internationally acclaimed festival in Digbeth, Birmingham, 22nd-24th June. 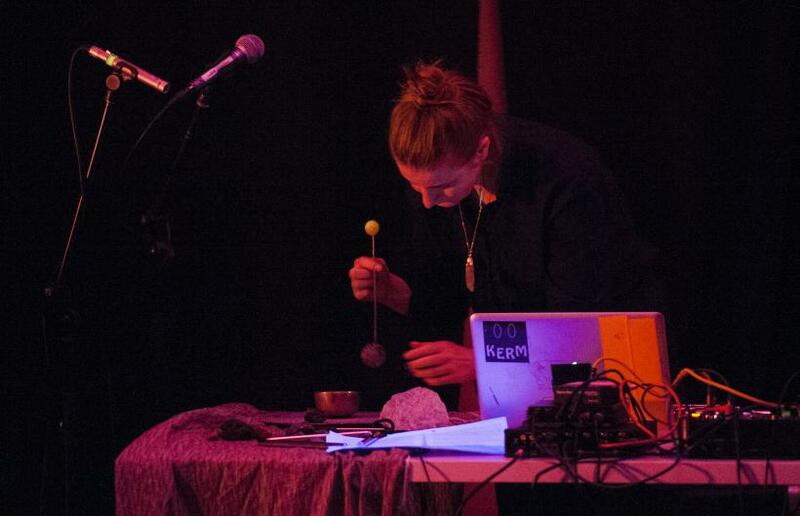 Both artists have a diverse practice which they weaved into their performance: Matana Roberts, a renowned composer, played with the subtleties of sound, such as the effect of a fan pushing soft puffs of air onto a microphone; Kelly Jayne Jones used electro-acoustics to draw out the sound of a large rock scraping against a contact microphone, which produced a scratching, heavy sound that rumbled intermittently throughout the piece. The artists felt their way through their performance and handled their instruments like masters of their tools, with precise accurate movements. 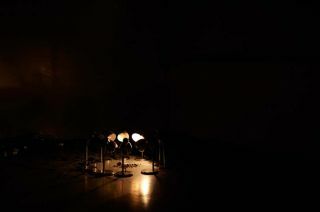 Throughout the performance, imagery of abandoned industrial spaces came to mind, due to the vacant quality of the sound they produced, such as a disused spinning roundabout in an empty park, evoked by the eerie, creaky quality of the sounds and a screeching sound akin to white noise, which intermittently flowed into the piece. The discord of sounds took me to another world in a dystopian future, evoking feelings of loss and loneliness, only interrupted by creatures rustling around in dark corners, and the drift of melodic saxophone music that would arrive into the setting. The performance could be described as an experiment, as it had no prescribed outcome. The cumulative effect of this durational performance created a visceral world, that could be conceived in varying ways by each listener. The piece lasted around an hour and was challenging, however the artists kept me in the palm of their hands, which at times Matana Roberts shifted metal chains between; leaving the residue of clinks reverberating through the speakers. 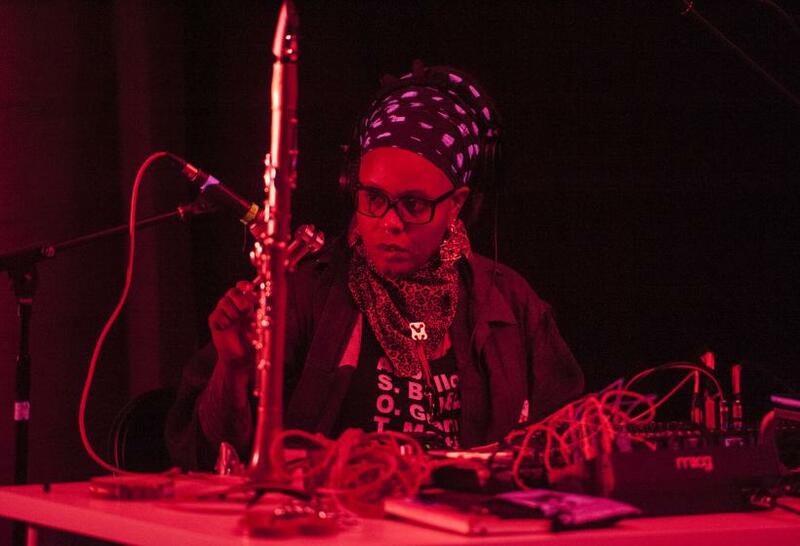 Great subtlety and ear-splitting sounds were recurrent markers in this distinct and poignant live work. 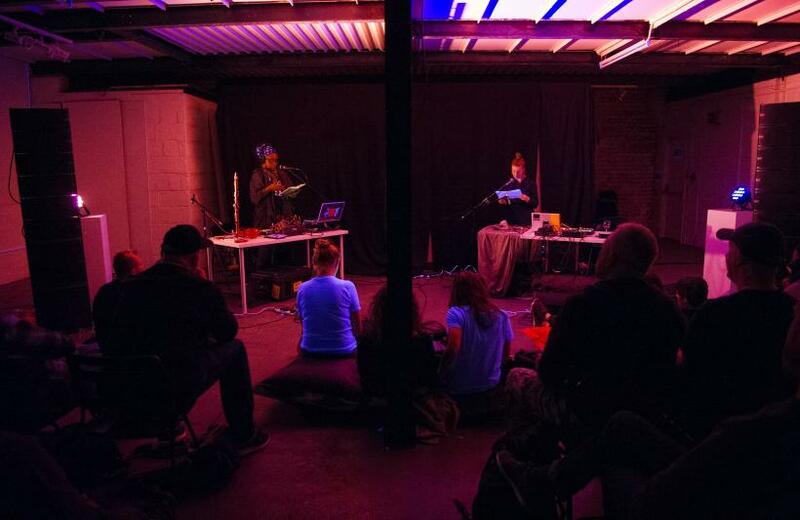 The connotations that arose in the performance were particularly apt in the industrial landscape of Digbeth, Birmingham where on the journey home a train passed over a bridge, shaking the infrastructure and producing a sharp reverberating rattle; it was an isolated, singular experience – like that of the live work of Matana Roberts and Kelly Jayne Jones, that draws awareness to the city environment, and equally, one’s presence within it. Supersonic Festival will take place on the 22nd-24th June, in Birmingham’s creative heart: Digbeth. Laura O’Leary is a freelance writer and programme assistant at QUAD. 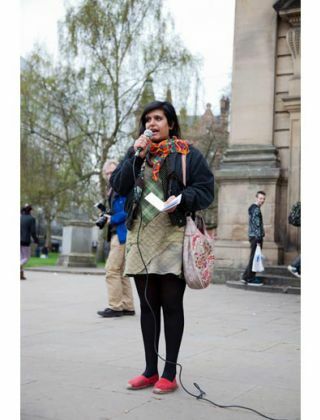 She is based between Derby and Birmingham UK.